To remove the pedal box I had to cut the end off the throttle cable (the cable is soldered at both ends). This left the inner cable too short to re-use so needed a new one. Cheapest way to do this is to just use a cycle cable and thread it though the existing outer cable - I picked up one for around £4. While I also had to cut off the end of this one, as it was 2m long it left plenty of spare length to play with. Rather than solder an end on, I repurposed a cable-connector, with 2 screws holding the end of the cable it was plenty secure. 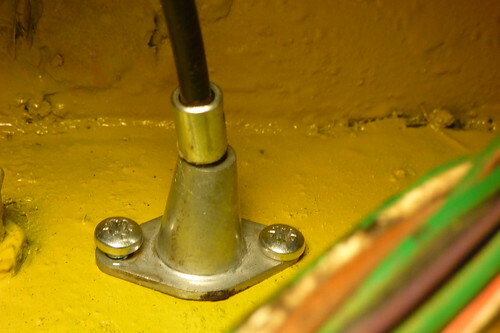 Also replaced was the cable anchor - the old one has perished - I don't think this will make a lot of difference to the pedal (I'd constructed a temporary fix using a couple of washers welded together) but it's good to have stuff back to how it should be.